Drink your way through the history of Sardinian wine. The history of Sardinian wine is a long one. Before Romans spread viticulture throughout their empire, before Greek and Phoenician traders shipped vines to colonies around the Mediterranean, Sardinia’s Bronze Age Nuragic civilization was cultivating local grapes and pressing them into wine. The first proof came in January 2015, when archaeobotanists discovered a cache of 15,000 perfectly preserved grape seeds inside a well carved deep in the rocks—a kind of prehistoric fridge. Then last December, chemists identified tartaric acids on a 2800-year-old wine press, confirming this civilization didn’t just eat a lot of grapes, but turned them into wine. These discoveries mean that Sardinia is the oldest known site for viticulture in all of Europe. That’s mind-blowing for scientists, overturning numerous theories, and it’s a source of genuine excitement for winemakers on the island, who hope that DNA testing will be next and finally settle the question: Were Sardinia’s flagship grapes—cannonau, carignano, and vermentino—imported by the Phoenicians, Spanish, or Corsicans, as previously thought? Or are they indigenous and spread through Europe from here? Fast-forward to modern Sardinian wine. The quick-moving transformations of the past 50 years are hard to summarize, but signposts exist at significant turning points—such as these seven bottles. Consider them quaffable clues that offer insight into particular moments in Sardinia’s wine history. The difference is, you can dispose of the evidence at dinner. Sardinia’s oldest winery in continuous operation is Sella & Mosca, founded in 1899 by two entrepreneurial brothers-in-law from Piedmont. Eriminio Sella and Edgardo Mosca came on a hunting trip, then stayed, first creating a successful nursery for grape vines (pictured), then a winery. Today it’s Sardinia’s largest, churning out 7 million bottles annually. Sella & Mosca’s biggest production is La Cala, which in the 1970s redefined vermentino, Sardinia’s most prevalent white. “It had been a weighty wine: strong in alcohol; residual sugar of 10 to 15 grams per liter; sometimes oxidized,” says enologist Giovanni Pinna. Tourists dining on seafood needed something lighter, fresher. So did the 20,000 workers at the new chemical plant in nearby Porto Torres, which had effectively supplanted the local fishing industry. At lunch, workers would dilute their rustic vermentino with soft drinks. “The winery asked itself, how can we make wine that’s lighter? The pergola [training system] allows grapes to grow in the shade. So they redid all the vineyards in the 1970s,” Pinna continues. “The first Cala was 11 percent and fresh.” That established the modern template for Sardinia’s everyday vermentino: light, refreshing, and seafood-friendly. If Sella & Mosca’s was the first modern vermentino, Capichera’s was the first serious, age-worthy one. Launched in 1980, the winery’s standard-bearer revealed the magic synergy of meticulous grape selection, batonnage, discreet oak aging, and granite soil. When Mario Ragnedda took over a small vineyard in the Gallura region, a neglected archeological ruin came with it. The plot was called Capichera, from the Latin caput erat, “it was the capital”. Turns out, a major Nuragic settlement was there. “Our tomb is the best preserved in Sardinia,” says Mario’s son, Emanuele, who played among the granite monoliths as a child. The family donated the archaeological site to the town (“It would be like keeping a pyramid to yourself”), but kept the vineyard and acquired more. They also sought out a living heritage: “We’re the only winery in the world that has six different clones of vermentino,” says Ragnedda. Two are found only on their land. “This is a treasure for us, and also a responsibility. If we lose them—because of wild boar or whatever—it’d be terrible. Massal and clonal selection are extremely important, the infrastructure of our production.” It’s all part of the synergy behind this rich, intense vermentino. Much of Sardinia remains wild and sparsely populated. It has one third the population of Sicily, an island of equal size, and five times as many sheep as men. Over the ages, it has kept to itself. So the emergence of enotourism represents a fundamental change in mentality, best embodied by Vigne Surrau and its sparkling Brut, a festive wine to share with friends. The winery itself is sleek, modern, and welcoming. An expansive wine bar with an ambitious events program is open 363 days a year. “We receive 20,000 visitors annually, which isn’t bad,” says sales manager Giovanni Melis. Vigne Surrau was the brainchild of four Demuro brothers, bigwigs in the construction-material business. The family had vineyards previously, but sold those grapes to a Gallura cooperative. In 2001, they started anew. Their flagship is Sciala, a Vermentino di Gallura (the island’s only DOCG appellation). But their sparklers are more emblematic of the winery’s convivial vibe. The fine Brut Millesimato is pure vermentino, while a unique Brut Rosé comes from 108-year-old cannonau vines. These limited-production wines are the only metodo classico sparklers made entirely on Sardinian soil. Surrau’s forward-looking investment in that equipment deserves a hearty cin cin. If there’s one man who changed the direction of Sardinian wine, it’s Giacomo Tachis. His magic act began in 1984 with Terre Brune. When Antonello Pilloni took over administration of the wine cooperative Cantina Santadi in 1975, it was dying, along with dozens of other 1960s coops. Pilloni’s vision for renewal involved shifting from vino sfuso to quality bottled wine. He reached out to Tachis, the enologist behind Sassicaia, the famed cabernet sauvignon/cabernet franc blend that launched the Super Tuscan juggernaut. Taking a leave of absence from Antinori, Tachis set his sights on carignano, heretofore a blending grape in undistinguished vino rosso. “We changed that,” says Santadi director Raffaele Cani. “It went from being an anonymous wine to a wine tied to territory.” And how. Today no grape in southern Sardinia is more prized than old-vine carignano. Its heartland is Sulchis, a coastal zone where centenary vines grow on ungrafted root stock in pure sand, and steady sea breezes beautifully concentrate the juice. Antonio Argiolas worked until the day he died at age 102. The founder of Argiolas winery wasn’t alone; Sardinia is full of centenarians. Some link that longevity to cannonau, the island’s most widely planted grape. A genetic cousin to grenache, it’s particularly loaded with antioxidants. Turriga, a cannonau blend, propelled both Argiolas and cannonau onto the world stage. The winery had been producing bulk wine for its first 50 years, but in 1988 began consulting with none other than Tachis. The enologist loved blends, especially those with French varieties. Argiolas, however, was a diehard loyalist to Sardinian grapes. They came up with Turriga, a full-bodied red that places cannonau front and center, then adds complexity with carignano, malvasia nera, bovale sardo, and two years in barrique. “Our idea was to use traditional varieties but with international style,” says granddaughter Valentina Argiolas. “Turriga matches innovation and tradition: innovation using new training methods, new technologies, but tradition using only Sardinian varieties.” Debuting in 1991 at the VinItaly wine fair, “Turriga was a success story from the beginning.” It was the first Sardinian wine to be exported, and today is the most highly rated. Second on that critics’ list is Barrua, another wine that bears the Tachis stamp. After two decades of working on Sardinian grapes, Tachis finally got his chance to do French/Sardo combos. He was the driving force behind Agricola Punica, a joint venture of Santadi and Tenuta San Guido (makers of Sassicaia), whose core philosophy is the blending of Sardinian and French varieties. “It was just a new challenge. Tachis was convinced he could get a very, very good product,” says export and logistics manager Salvatore Santus. The project began in 2002 with the purchase of land in the Carignano di Sulchis area, where they augmented old bush-trained carignano with cabernet sauvignon, merlot, and syrah and created two red blends: Barrua and Montessu. (The white Samas, combining vermentino and chardonnay, followed.) Barrau, their top wine, marries the plush dark fruit of carignano and merlot with the structure of cabernet, wrapped in an oak veneer. It has the elegance, polish, and persistence that Americans love. (We’re its best market.) 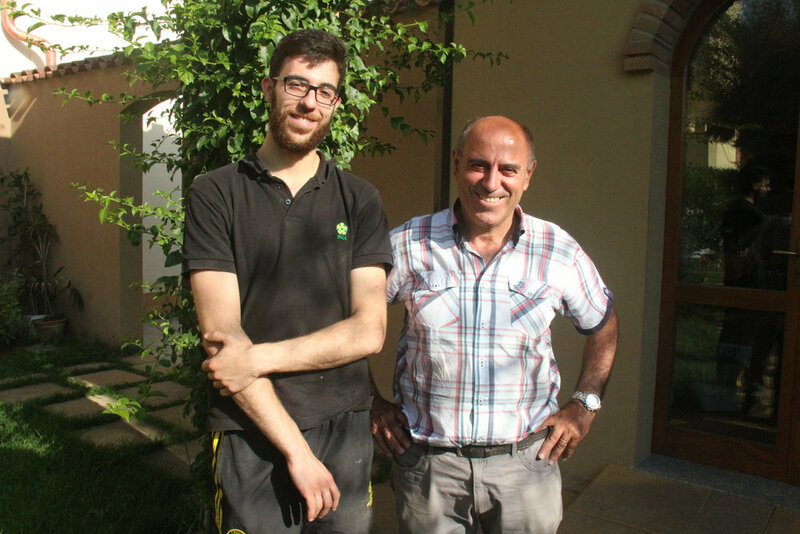 Tachis’ legacy continues with his pupil Umberto Trombelli, winemaker at both Santadi and AgriPunica. AgriPunica’s embrace of international varieties remains the exception to the rule. Unlike Sicily, Sardinia never got on that bandwagon. Instead, it revels in its local traditional grapes: bovale sardo, nasco, nuragas, malvasia, and monica near the southern capital of Cagliari; carignano on Sulchis’s sandy soils; cannonau in the center and north; vernaccia near Oristano; vermentino and moscato in Gallura; and torbato in Alghero. Pala works with seven of those varieties on eight vineyard sites. (In land holdings, the winery is among Sardinia’s largest.) Founded in 1950 by the grandfather of Mario Pala, who now runs the show, the winery has a reputation for modern wines with great price/value. Its biggest sellers are vermentino and cannonau. (It even ran out of cannonau after the book Blue Zones of the World popularized the longevity link.) But its most unique wine is Essentija Bovale, which showcases a grape that just might be on the cusp of rediscovery. “We made it because we like it,” says winery manager Fabio Angius. “It wasn’t to follow the market.” Indeed, Pala was the first to bottle a monovarietal bovale, normally a blending grape that adds color, acidity, and tannin. “The berries are so small that when they’re mature, there are more seeds than pulp,” says Pala. On its own, bovale is a powerhouse. Coming from Pala’s ungrafted vines of up to 100 years, it’s an award-winner. Essentija has already spawned a handful of followers, beginning yet another chapter in Sardinia wine. Published in the May/June 2017 issue of Tastes of Italia magazine.